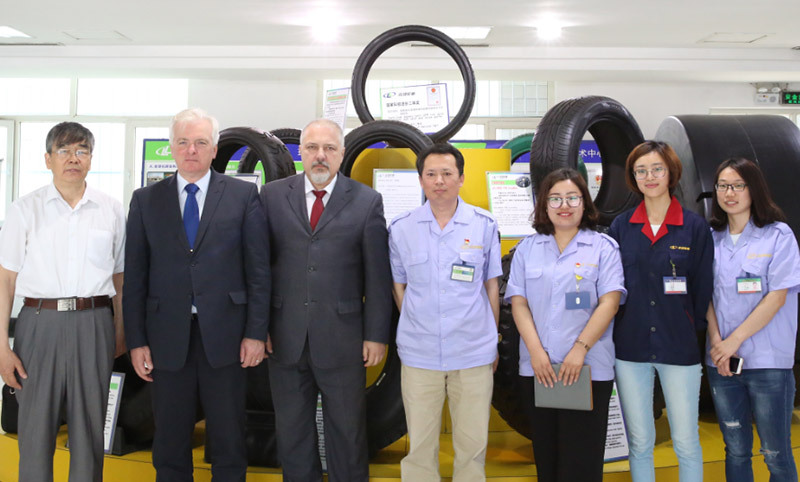 Slovakia Ambassador to China Visited Linglong Tire | Linglong Americas, Inc.
On May 18th, Slovakia ambassador to China, Mr. Dusan BELLA, and economic counselor, Mr. Miroslav TOMO, paid a visit to Linglong Tire. They visited Linglong’s R&D center and PCR plant #6 in Zhaoyuan, Linglong Tire’s HQ, accompanied by Liu Zhancun, vice president of Linglong Tire, and Li Wei, deputy general manager of Linglong Tire. The two guests spoke highly of Linglong tire’s technical level and intelligent manufacturing level. After the visit, the two sides held a friendly talks. Ambassador Dusan BELLA and counselor Miroslav TOMO introduced Slovakian investment policy and taxation and labor provisions to Linglong Tire and said that Slovakian government was willing to communicate directly with Linglong Tire and provide accurate and reliable information and policy to help Linglong to build its second overseas manufacturing base. At the end of the meeting, they sincerely invited Linglong Tire to invest and build factories in Slovakia. Slovakia is located in the center of Europe with convenient traffic conditions. Its annual output of automobiles is around one million, its speed of economic growth is the fastest among the four countries in central Europe. At present, there are more than 100 Korean companies and a number of German companies setting up factories in Slovakia. As an important part of Linglong tire "3+3" strategy, LLIT, Linglong Tire’s first overseas manufacturing base, has achieved a great success in Thailand, contributing to the local economic development and social welfare. Therefore, the location of Linglong’s second overseas base has aroused widespread concern in many European countries. Currently, Czech, Slovakia, Belgium and other countries have extended an olive branch to Linglong Tire.